The Storm edged the Mystics, 75-73, to grab a 2-0 series lead. Defense was the key for Seattle in Game 2. 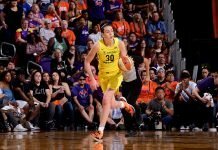 Breanna Stewart played like the MVP that she is in the win. Sue Bird used “the Sue Bird move” as part of her arsenal. Are the Mystics half full of half empty after Game 2? Alysha Clark has evolved into a star for the Storm. A’ja Wilson is the unanimous rookie of the year. The all-rookie team also included Diamond DeShields, Ariel Atkins, Azura Stevens and Kelsey Mitchell. Wilson’s rookie year rates among the greatest in WNBA history.